The two Sundays that follow Pentecost are the feasts of the Most Holy Trinity and the Body and Blood of Christ. The Church now focuses our thoughts on two central and unfathomable mysteries of our Catholic faith - the mystery of our Triune God - one God in three persons - and the mystery of the Holy Eucharist - the real, living presence of Jesus Christ in body, blood, soul and divinity. In our first reading (Deuteronomy 4:32-34, 39-40), Moses spoke to the Israelites as they prepared to cross over into the promised land. He reminded them of the awesome glory of their God. A God who loved them into existence and chose them for his special mission on Earth. In our reading today, Moses calls them to faithfulness, to "know, and fix in your heart, that the Lord is God." Moses said to the people: "Ask now of the days of old, before your time, ever since God created man upon the earth; ask from one end of the sky to the other: Did anything so great ever happen before? Was it ever heard of? Did a people ever hear the voice of God speaking from the midst of fire, as you did, and live? Or did any god venture to go and take a nation for himself from the midst of another nation, by testings, by signs and wonders, by war, with strong hand and outstretched arm, and by great terrors, all of which the LORD, your God, did for you in Egypt before your very eyes? This is why you must now know, and fix in your heart, that the LORD is God in the heavens above and on earth below, and that there is no other. You must keep his statutes and commandments that I enjoin on you today, that you and your children after you may prosper, and that you may have long life on the land which the LORD, your God, is giving you forever." In our Gospel reading (Matthew 28:16-20), we hear the conclusion of Matthew's Gospel as Jesus gave final instructions to his disciples, to "go, therefore, and make disciples of all nations." 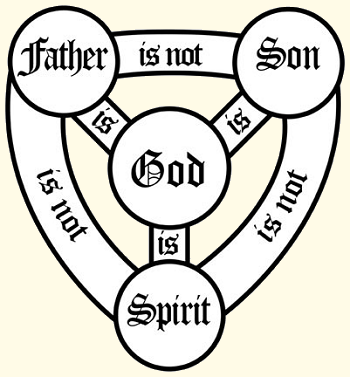 It is in the name of the Holy Trinity, Father, Son and Holy Spirit, that he sent them. This is perhaps the clearest indication in the New Testament of the knowledge of the Holy Trinity. In our Epistle reading (Romans 8:14-17), St. Paul reminds us that we are children of God by adoption. In this short passage, we hear mention of the Father (Abba), the Son (Christ) and the Holy Spirit, all referred to as God. --"if only we suffer with him so that we may also be glorified with him". Brothers and sisters: For those who are led by the Spirit of God are sons of God. For you did not receive a spirit of slavery to fall back into fear, but you received a Spirit of adoption, through whom we cry, "Abba, Father!" The Spirit himself bears witness with our spirit that we are children of God, and if children, then heirs, heirs of God and joint heirs with Christ, if only we suffer with him so that we may also be glorified with him. There is a line in the popular movie, The Shack, where "Mack", the protagonist, is together with the three persons of the Trinity. He asks them, "Which one of you is God". They all respond in unison, "I am"., or it could be "I AM", a biblical reference to Yahweh. The divine persons are really distinct from one another. "God is one but not solitary." "Father", "Son", "Holy Spirit" are not simply names designating modalities of the divine being, for they are really distinct from one another.